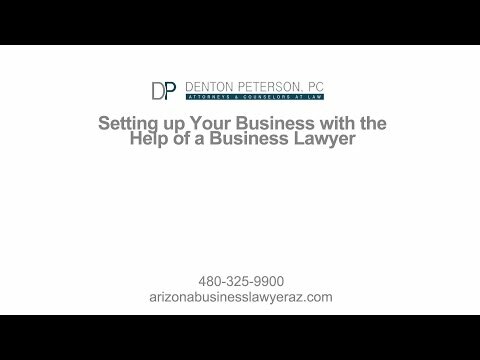 Best Phoenix Business Lawyers & Attorneys at Denton Peterson, P.C. Only another business owner can really understand all the excitement and responsibilities that come with owning and operating your own business. While you have control over your own destiny, you are also responsible for many tedious tasks such as tax, employment and legal obligations. The attorneys at Denton Peterson understand what this is like because we do it all as business owners ourselves. Our Phoenix business lawyers can help you manage the legal complexities of owning a business, from getting started, to minimizing your liability, to bringing a suit against negligent vendors and much more. We have the experience and the expertise to guide you through all the legal issues relevant to your business, and we negotiate, mediate and litigate on your behalf to protect your interests. The legal entity you choose for your business and its setup are some of the most important decisions you can make. The type of entity you choose and its organization determine how you will be taxed (both personally and for your business), how profits will be shared, the extent of your protection from the actions and liabilities of your business, who can make decisions for the business, and more. If you make the wrong decision about the type and setup of your entity, it could cost you dearly. Many variations of these entities are available, as well, and your business lawyer will help you understand the benefits and disadvantages of each. If your business grows or needs change, our Arizona business attorneys can help you reorganize your business to create the new entity that works best for you. Our firm also helps companies based outside of Arizona to organize entities in the state or to form franchises here. We can help you apply for trade names and ensure that the proper documents are filed to structure your business. You have to file many documents with the state and federal authorities to establish your business and maintain it. If you don’t file these documents, or if you file them late, you can face serious penalties. If you file the documents incorrectly, you leave yourself open to penalties and liability. Denton Peterson corporate lawyers can take care of these business filings on your behalf, ensuring that everything that is required is submitted on time and properly. Hiring a Phoenix business lawyer to handle these filings for you can free up valuable time to focus on doing what you know to do best: growing your business. We ensure that you meet all your legal requirements and free you of the burden of having to complete these legal and administrative tasks yourself. Call Denton Peterson today to talk with a Phoenix corporate lawyer who can help you and your business. Creating and reviewing contracts can take up a great deal of your time as a business owner. You must have a contract for everything from a large inventory order to a new employee hire. And if you make even the smallest mistake in wording or leave out even one key phrase or sentence, you could leave yourself vulnerable to serious liability. By working with an experienced Phoenix corporate lawyer, you can hand this responsibility off to an experienced professional and feel relieved to know that your interests are protected and you have more time to focus on other aspects of running your business. The Denton Peterson attorneys can negotiate, review and draft all types of business contracts on your behalf. Our attorneys carefully consider your needs, and draft and review the details of the contract to ensure that it meets your requirements and does not have any loopholes that could leave you vulnerable to liability. Whether we are writing the contract or reviewing it, we make sure that you have the legal protection you need. Litigation is a common aspect of doing business, unfortunately. At some point, you are likely to find yourself the subject of litigation or in a position that you need to bring litigation against an employee, a negligent supplier, or a partner who defrauded you. You will need an experienced Phoenix litigation lawyer to protect your interests, whether you are the plaintiff or the defendant. Our attorneys are experienced in litigation from both sides of the aisle. We represent clients in a variety of cases, including contract disputes, torts, matters of corporate governance, real estate transactions and more. Whether you are just getting your business started or you have been around for years and are facing litigation or a difficult situation, our attorneys can help you. Call Denton Peterson today to talk with a Phoenix corporate lawyer who can help you and your business.